Integrating several transistors and other components in one semiconductor device to produce an integrated circuit was first performed by Jack Kilby of Texas Instruments in 1958. Integrated circuits started to be used in calculators from the mid 1960s. However, techniques were slowly developed for putting more and more transistors on a small chip, so that a single chip could perform more complex functions. From about 1965 to about 1971 the development of integrated circuits for calculators was at the leading edge of electronics research, and took place almost exclusively in the U.S.A.
One of the pioneers was the Victor Comptometer Corporation. The journal "Electronics" of October 18th 1965 announced "The first commercial equipment to use metal-oxide-semiconductor (MOS) integrated circuits will be introduced at the Business Equipment Exposition in New York City next week when the Victor Comptometer Corp.'s Victor 3900 makes its debut. The desk-top calculator uses MOS ICs that contain 250 transistors each. The integrated circuits are made by General Micro-electronics, Inc."
However, General Micro-electronics had great difficulties making the integrated circuits and the Victor 3900 (featured on this site) only appeared in prototype form, its launch being dragged out over several years before being finally abandoned. The first integrated circuits included only a small number of transistors in each package, and performed the function of a small number of logic gates. These are known as Small Scale Integration (SSI) integrated circuits, and were still required in dozens in calculators. SSI integrated circuits in the Facit 1123. 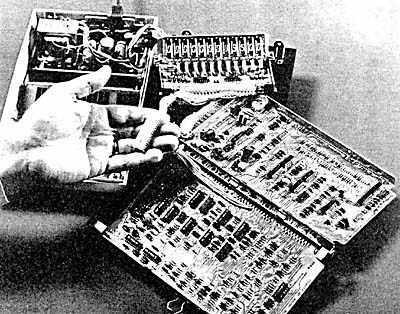 As today, with the race to put more and more transistors and functions into microprocessors in PCs, so then there was a race to put more and more of the calculator's electronics onto the chips. Medium Scale Integration (MSI) integrated circuits put whole subsystems onto a single chip, so the number of chips required was greatly reduced. Above are six MSI integrated circuits on one of the circuit boards of the Ricoh RICOHMAC 1200. In Large Scale Integration (LSI) integrated circuits, hundreds or thousands of transistors were manufactured on one chip, and calculators were produced using just three or four LSI chips. The four LSI integrated circuits in the Sharp QT-8D, the first calculator to use LSI, in 1968. In practice, the categories of integration merge into each other and it is not always possible to say into which group a chip belongs. The ultimate goal was to squeeze the all of the transistors for the calculating functions onto one chip to give a "Calculator on a chip". This was achieved by Mostek in 1969 and was first used in the Busicom Junior/NCR 18-16. However, for a few years additional components were required to drive the display. This was because the higher voltage and/or current drive requirements were not compatible with the transistors that it was then possible to manufacture on a LSI integrated circuit. Either individual driver transistors were used, or special purpose driver integrated circuits. By the mid 1970s LSI had developed to the point where it was possible to integrate the display driver transistors too to give a real "Calculator on a chip". The circuit board in the Busicom Junior/NCR 18-16, the first calculator to use a "Calculator on a chip", the Mostek MK6010. Note that additional display driver transistors are required. Cutting edge technology of 1971, the Mostek MK6010 "calculator on a chip". The integrated circuit is also marked with the NCM (Nippon Calculating Machines) logo, the parent company of Busicom. The chip held in the hand replaces the two circuit boards full of components, including 22 MSI (Medium Scale Integration) integrated circuits, see article below. 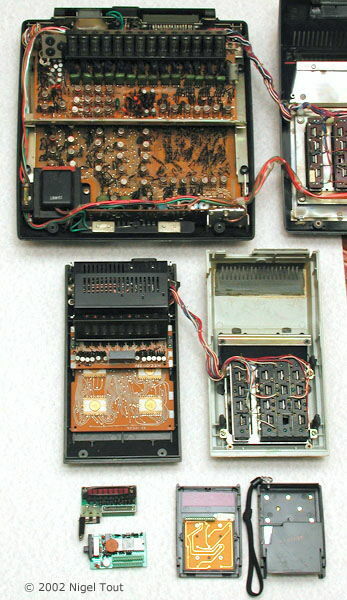 The single chip, using a p-channel process, replaced 22 chips in the previous version of this Busicom Junior calculator, and reduced the number of circuit boards from two to one. Note that separate transistors are still needed as high-voltage display drivers. This was the first use ever of a single chip for all the functions of a calculator, described then as a "Calculator on a Chip". It was the cutting-edge technology of the day . This was the culmination of the gradually increasing integration during the late 1960s, accompanied by reducing number of components. Driving the display required higher power transistors which could not be easily integrated with the logic circuits on the chip, but within a couple of years this was achieved and the only electronics required for a simple calculator was the one chip. Assembly was much simpler so low labour costs were not so important and many manufacturers appeared in the U.S.A. and Europe. A few years later, when the cost of the chip, display, and keyboard had dramatically fallen, the assembly cost again became a large proportion of the total cost and manufacture returned to low labour-cost countries. The development of electronics had now reached the stage at which a truly pocket-sized calculator was possible. In 1972 the Journal "New Scientist" said "Electronic calculators today provide the largest market for LSI, which is mostly the of the metal oxide semiconductor (MOS) type. Hitachi and one or two other LSI manufacturers have adopted the ion implantation technique, while Ferranti in Britain has developed bi-polar LSI using a collector diffusion isolation (CDI) process for single chip circuits which it is producing for Sumlock Comptometer. ... Of the standard MOS chips, Texas Instruments is the largest supplier, ..."
In 1972 Toshiba produced the first calculator CMOS (Complementary Metal-Oxide Semiconductor) Integrated Circuits, used in the Sharp EL 801. The advantage of CMOS is the low power requirement - one transistor of a switching pair is always off and current only flows in brief bursts during the switching period. The power consumption of the ICs in this calculator was only 2 milliwatts, about 1% of the current drain of comparable p-channel MOS circuits. This was to be the technology that all calculators would end up using. 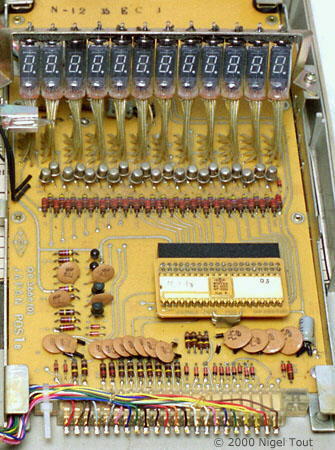 The lower small circuit board, above on the left, carries three CMOS integrated circuits in the Sharp ELSI EL-801. 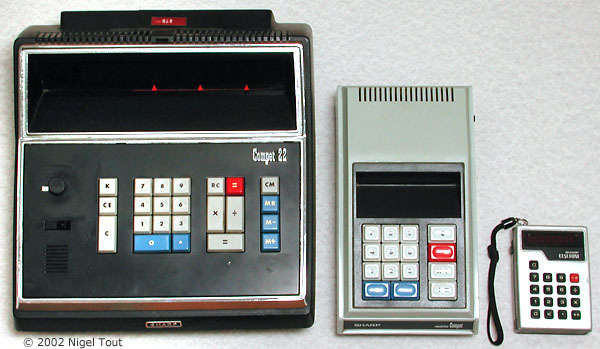 From left to right, Sharp Compet 22, Sharp QT-8D, Sharp EL-801. The photographs above and on the left illustrate the size reduction over about 4 years made possible by developments in integrated circuits. All three are basic four function calculators. Sharp Compet 22 of 1968, with many medium-scale integration (MSI) integrated circuits, AC powered. Sharp QT-8D of 1969, with four large-scale integration (LSI) integrated circuits, AC powered. Sharp EL-801 of 1972, with two CMOS LSI integrated circuits, battery powered. 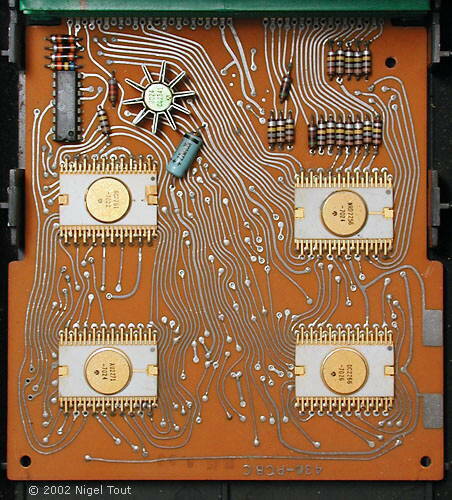 Close up of the circuit board of a National Semiconductor Novus 650 calculator of 1976, showing the blob of resin covering the two integrated circuit chips which are directly bonded to the circuit board. One chip performs the calculations and the other drives the LED display. "Calculator technology has just taken one I further step—and pretty near the last— along the road to miniaturisation. National Semiconductor's latest scientific calculator contains no packaged integrated circuit ("chip") as we have come to know it. Instead of using the encapsulated chip—in a dual in-line assembly—the silicon microcircuit in this case is bonded on to the printed circuit board direct. This technique has been used for some years now as far as light emitting diode (LED) arrays are concerned. Indeed, National Semiconductor pioneered the mass production of this technique in its latest clock modules. In the company's new model 852 calculator, the keyboard is the largest component. The actual "works" are smaller than the PP3 battery that powers the calculator. Two chips are bonded on to the board, both housed under the black plastic protecting cap. One contains the scientific calculator functions—the other the drivers for the LED display. The light emitting diodes are also bonded to the same printed circuit board and are protected by magnifying lenses. This type of construction not only cuts costs but also increases reliability as there are relatively few interconnections."